In the small town of Pine Cove, the Holloway family have been known for their magic for generations. Emma’s family has baked magic infused cupcakes to fix what ails, bring contentment, success, or lift someone’s spirits. Emma meets a new, handsome man in town and sells him her “success” cupcakes. He eats all three, before Emma finds out that he is Hunter Kane, a big city entrepreneur who has come to Pine Cove Island to build a competitive business near her cupcake/sweet shop. Emma can’t afford to lose any business as money is very tight. Her old house is in need of urgent repairs, her mortgage is past due, and she can’t pay her rent on her shop. Emma wants Hunter gone, so she and her cousin plan to whip up a cupcake that will make him want to leave. Unfortunately, their intense and irresistible attraction to one another has Emma reevaluating her plan of baking a magical “be-gone” cupcake to get rid of him. 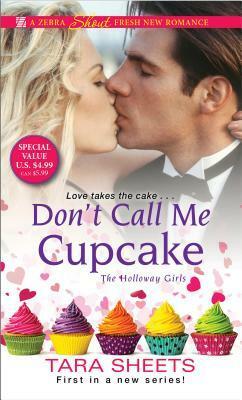 Don’t Call Me Cupcake was a sweet, magical romance that I really enjoyed. Hunter and Emma knock heads a bit when they first meet, but sparks flew every time they were together. They were fun together and even though there was a mutual attractions, they were careful and did not rush into a physical relationship. I loved the magical aspect to the story. We had Emma’s special cupcakes, Juliet’s magic with plants and flowers and the house itself. Things were moved and found all over the place and always when they were needed. The story itself was sweet, with wonderful townspeople, some good character building, some angst, missteps, and even an ex-boyfriend who causes some problems. Pine Cove sounded like a quaint, beautiful seaside town, making the story even more charming, and a place I would love to visit. I really enjoy the Holloway Girls and look forward to reading Juliet’s story in the next book in this series coming out later this month. About the Book (From Goodreads): There’s a very special kind of sweetness to life on Pine Cove Island . . . Most families have a favorite recipe or two, handed down through generations. The Holloway women are a little different. Emma Holloway, like her grandmother before her, bakes wishes into her delicious cupcakes, granting the recipient comfort, sweet dreams, or any number of good things. It’s a strange gift, but it brings only happiness. Until gorgeous, smooth-talking newcomer Hunter Kane strolls into her shop, Fairy Cakes–and Emma makes the mistake of selling him not one, but three Sweet Success cupcakes. Hunter, it turns out, is opening a fancy new restaurant and bakery right on the waterfront–Emma’s competition. To make matters worse, the town committee has decided to split the upcoming summer festival contract between the two, forcing Emma to work with her nemesis. But she can’t afford to split her profits. The solution: create a recipe that will make Hunter leave town permanently. The Holloway charms are powerful. But there are other kinds of magic in the world–like red-hot first kisses, secret glances, and the feeling that comes with falling truly, madly, inconveniently in love . . .
About the Author: Tara Sheets is an award-winning author of contemporary romance and women’s fiction. Her debut novel, Don’t Call Me Cupcake, is a winner of the 2016 Golden Heart® award sponsored by Romance Writers of America®. It is the first in The Holloway Girls series, available from Kensington Publishing. When not writing, Tara enjoys life with her book-loving family and a book-eating dog named Merlin. Come visit her at www.TaraSheets.com or on Twitter via @Tara_Sheets. This book sounds interesting and sweet! I love romance books with magical elements!! This is a perfect book to be made into a movie. The magic was not over the top, just added a real nice touch.